Your inner history buff will appreciate Palatine Hill and Colosseum. Get some cultural insight at Trastevere and Vatican Museums. The adventure continues: steep yourself in history at St. Peter's Basilica, don't miss a visit to Pantheon, pause for some serene contemplation at Santa Maria in Trastevere, and get to know the fascinating history of Piazza Navona. To see traveler tips, more things to do, where to stay, and tourist information, refer to the Rome trip itinerary planner . Berlin, Germany to Rome is an approximately 5.5-hour flight. You can also drive; or take a train. Expect a daytime high around 24°C in April, and nighttime lows around 11°C. Wrap up your sightseeing on the 9th (Sun) early enough to take a train to Florence. Visit Cathedral of Santa Maria del Fiore and Basilica San Miniato al Monte for their historical value. Get a sense of the local culture at Academy Of Florence Art Gallery and Pitti Palace. Change things up with these side-trips from Florence: Castello del Trebbio (in Santa Brigida) and Guardastelle Vineyard (in San Gimignano). The adventure continues: explore the world behind art at Uffizi Galleries, get engrossed in the history at Basilica di Santa Croce, make a trip to Piazzale Michelangelo, and contemplate in the serene atmosphere at Campanile di Giotto. For photos, reviews, maps, and more tourist information, use the Florence travel route planning tool . Getting from Rome to Florence by train takes about 2 hours. Other options: drive; or fly. In April in Florence, expect temperatures between 22°C during the day and 11°C at night. Cap off your sightseeing on the 12th (Wed) early enough to catch the train to Bologna. 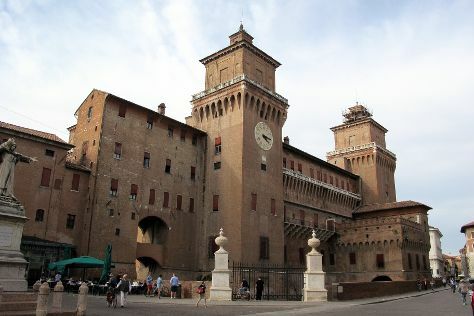 On the 13th (Thu), indulge in some culinary diversions at a local gastronomic tour, make a trip to Piazza Maggiore, then contemplate the long history of Basilica di San Petronio, and finally ponder the world of politics at Castello Estense. Get ready for a full day of sightseeing on the next day: take in the architecture and atmosphere at Basilica - Santuario di Santo Stefano, then do a tasting at Azienda Agricola Botti di Bovina Fabio, and then soothe aching muscles at Massaggio Californiano. To find photos, reviews, where to stay, and more tourist information, refer to the Bologna trip itinerary builder tool . You can take a train from Florence to Bologna in an hour. Alternatively, you can drive; or take a bus. In April, daytime highs in Bologna are 22°C, while nighttime lows are 10°C. Wrap up your sightseeing on the 14th (Fri) early enough to drive to Venice. 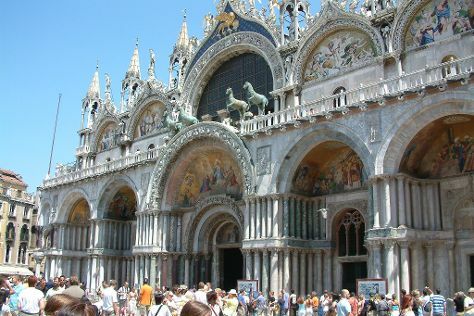 Do some cultural sightseeing at Basilica di San Marco and Doge's Palace. Visit St. Mark's Square and Peggy Guggenheim Collection for their historical value. There's still lots to do: explore the activities along Canal Grande, snap pictures at Ponte dei Sospiri, enjoy breathtaking views from St Mark's Campanile, and take a stroll through Cannaregio. To find more things to do, other places to visit, traveler tips, and other tourist information, you can read our Venice tour itinerary planning app . Drive from Bologna to Venice in 2 hours. Alternatively, you can take a train; or take a bus. In April in Venice, expect temperatures between 21°C during the day and 11°C at night. Finish your sightseeing early on the 17th (Mon) to allow enough time to travel back home.